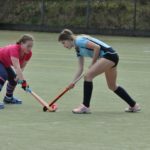 Third time lucky was the order of the day as the Arran Ladies hockey team finally got to play their first match of the year! Weather, boats and pitch conditions had all conspired to the postponement of the first two games of the year which leaves the club facing some doubleheader weekends. The 11.05am ferry sailing was running late, due to foot passengers having to disembark via the car deck, so we had a quick sprint to get to Glasgow in time for a 2pm pass back, and thanks to Bobby the driver for Coast to Coast they even managed a five minute warm up! Truth be told it should be described as a cool down as they left their warm bus to face pouring rain and a force 10 gale. Thankfully within five minutes of the whistle the rain stopped, as did the wind and Arran got down to the business at hand. Western fielded a mixed team of mature players with a sprinkling of youngsters – a bit like the visitors – who continuously subbed throughout the game. Arran were fortunate to have 13 players thanks to Billy Dunlop who umpired for them, so were in a position to get fresh legs on the pitch . Arran dominated most of the first half with good possession and plenty of shots on goal, Westerns defence was strong and it took till the 15th minute for Arran to score their first goal from a short corner. Hazel received the ball from injector Lorraine, a cracking first shot from her was saved and Lorraine was there for the rebound to find the back of the net. Isla, Lorraine and Nelly were the starting forward line with Cerys subbing with Isla. Both girls stick work and confidence are going from strength to strength with each game and they did a great job in the left wing position. Midfielders Mia, Hazel and Susie were kept busy in the first half and the second goal came from a long pass up the field from Suise to Lorraine who flicked it past the goalkeeper after running the ball through two defenders. 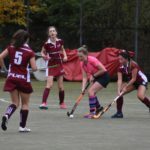 The defence line of Pauline, Faith, Jenny and Freya – not forgetting our ninja goalie Ali – worked tirelessly to thwart westerns attacks, particularly when dealing with the high flicks which Western were very good at. They were denied a goal when one such shot hit the crossbar and was quicky cleared by Ali. Being two goals ahead Arran mixed things up a bit in the second half, Jenny moved to the right-wing and Nelly took up the right back position where her long shots opened up the play which in turn helped add to the scoreline, Megan did a great job as left back which allowed Pauline to move to centre mid, who thoroughly enjoying being back on the pitch for the first time in a while. This meant Freya could take hazel slot at centre mid. The second half saw Arran get their third goal in the 11th minute. 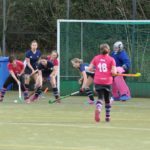 Once again it was Lorraine who got her stick on the end of the ball to score but Arran were full force in the circle and Mia was only inches away from claiming the goal – it won’t be long before you add to your tally Mia. Lorraine was on fire and the fourth and final goal was a well worked midfield push which she finished with style. Hazel played brilliantly and was deservedly voted dame of the game, Nelly, Freya and Jenny showed they are as strong in both forward and defence positions and most importantly everybody gave their all and played well as a team. The day was topped off by a delicious party bag each from Western, the usual pit stops in Ardrossan and the wee congratulatory announcement on the boat. A big shout out for Hazel’s three wee munchkins who shouted the team on from the dugout, although they had some competition from the pitch . A huge thank you to Billy Dunlop for umpiring and to all the other supporters . 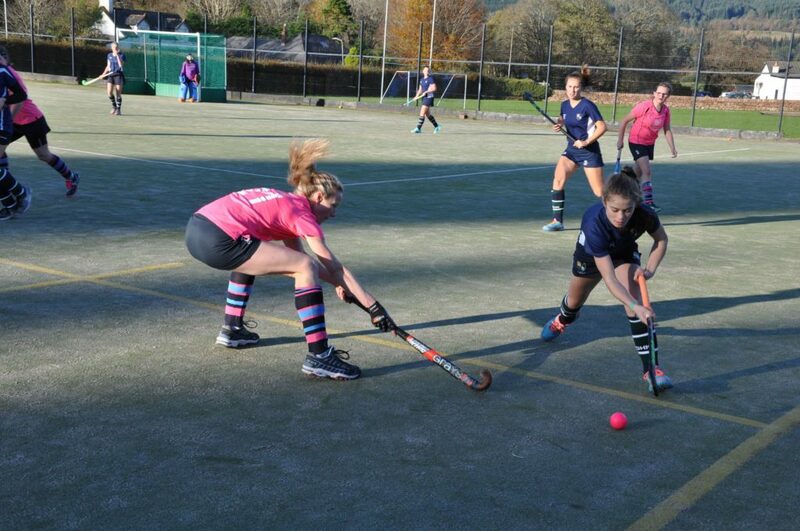 Next match is away to East Kilbride where they will be playing in their lovely new pink tops kindly sponsored by Arran Active.